An often overlooked design piece in an occasion, designs for your menu cards play a vital role in the success of your event or business. 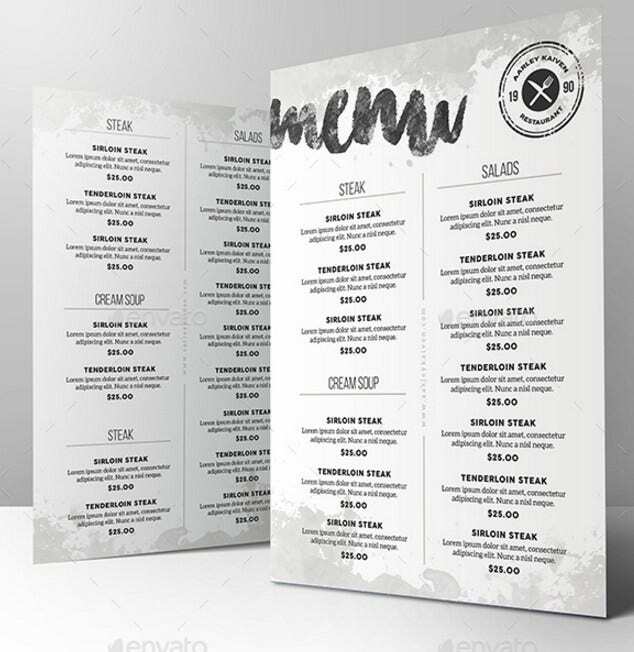 Menu card designs are extremely important because they are an extension of your theme and aesthetics. They emphasize the brand of your company, event, or restaurant expressed through illustrations, colors, typography, and the like. Moreover, they make the dining experience for your guests even more intimate and surreal. Watercolor is one design method that’s loved by many. Watercolor designs make your menu cards more raw and authentic because of their hand painted quality. They also give off a light and charming vibe that’s perfect for wedding receptions, birthday parties, bridal showers, and so much more. 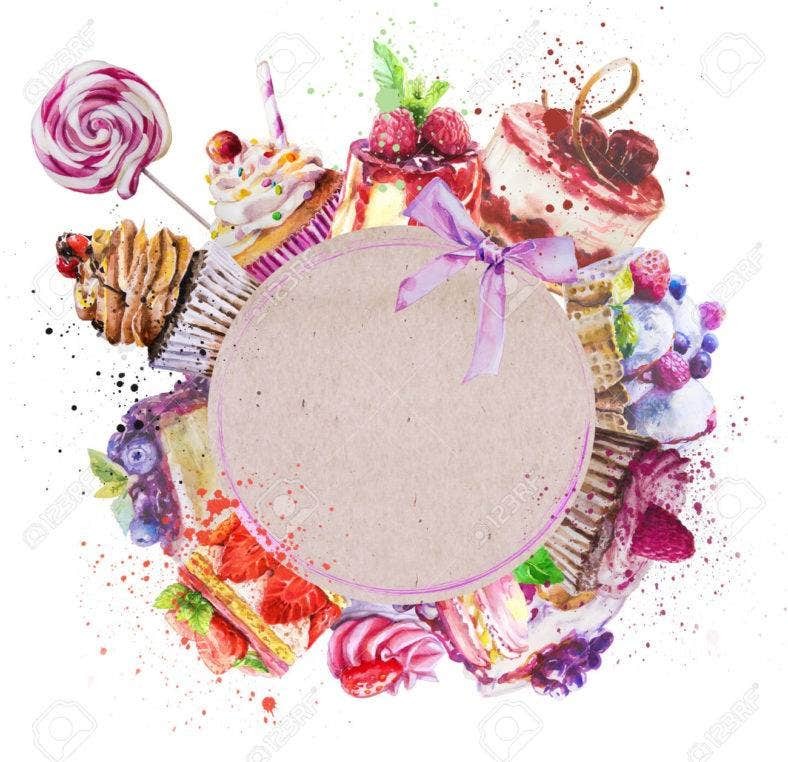 That being said, we’ve prepared a list of sample menu designs in watercolor to give you quality and ready made designs for your events or cafe business. Get free and premium items right here that are downloadable and highly customizable. Start scrolling! This Watercolor Gradient Calligraphy Menu exudes serenity and elegance with its monochromatic color scheme and clean typography. 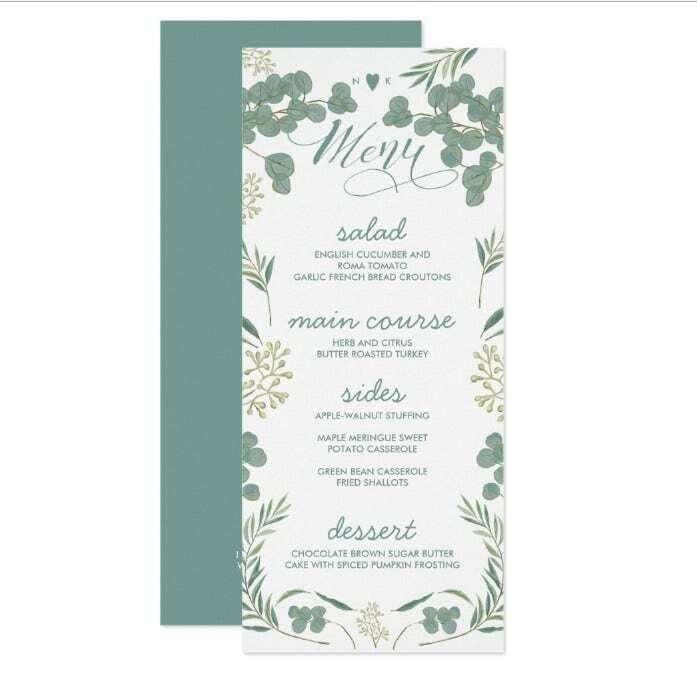 It’s a simple menu card you can wonderfully display at wedding receptions, beach dinner parties, and other intimate dinner gatherings. Get this easy to edit and print-ready design with just a click of a button. Get this Pink Watercolor Brushstroke Menu Design if you want a simple and spontaneous design for your wedding reception. 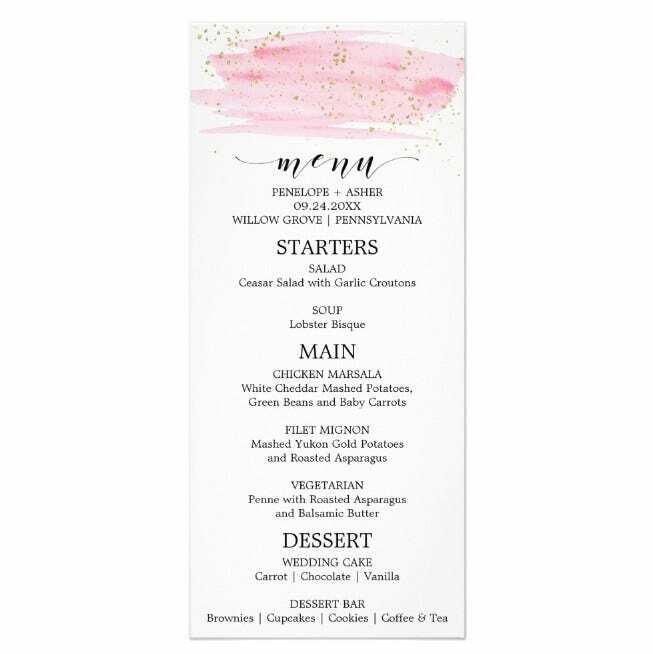 This wedding menu sample incorporates a unique watercolor brush stroke of salmon and pink hues to create a minimalist abstract background with a clean text to present your entrees. 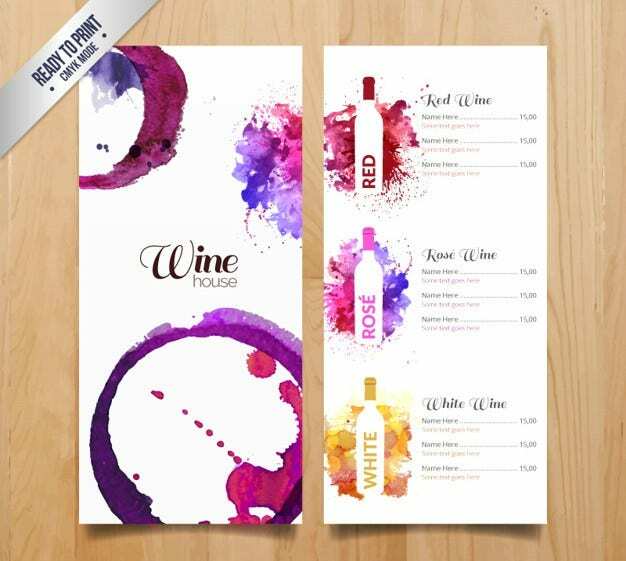 Download this design to get beautiful watercolor illustrations for your wine menu. It wonderfully presents different types of wine through watercolor splashes that create stencils of wine bottles. The front cover also uses deep colors for watercolor bottle stains as a unique way of presenting their menu cards. Download a sample restaurant menu that can show off your steak and drinks in a presentable and engaging fashion. The Watercolor Brush Strokes Steak Menu is available for download and customization to give you just that. 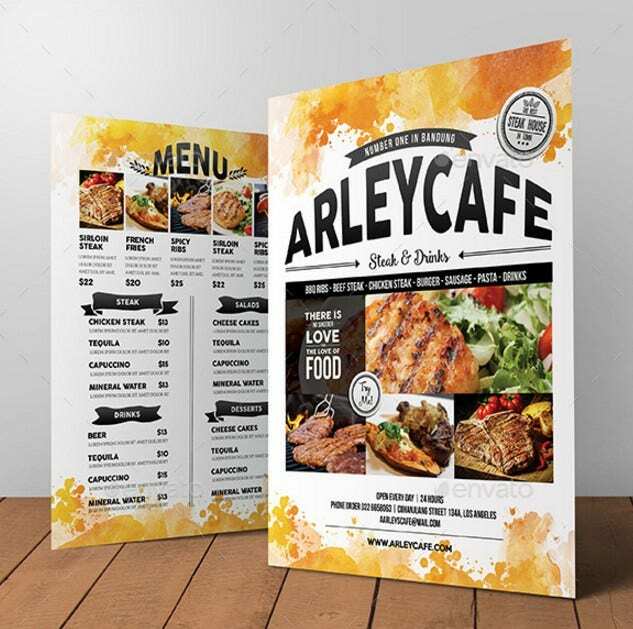 With this menu template, you can customize the colors, text, and images to fit the theme of your restaurant or cafe. A unique and sultry Valentine’s menu template that will have you and your date fall even more in love is beautifully embodied by this Navy Blue and Gold Menu Card. Download this watercolor menu card design for a clean, elegant, and intimate finish. It has a minimalist watercolor design that can intrigue anyone, with witty labels for food categories. 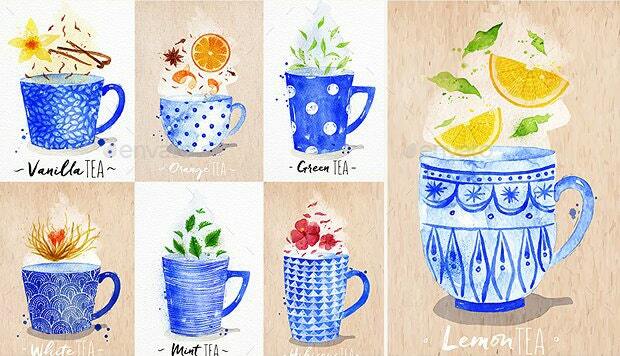 Bask in watercolor illustrations all throughout your menu cards with these Watercolor Tea Menu Illustrations. 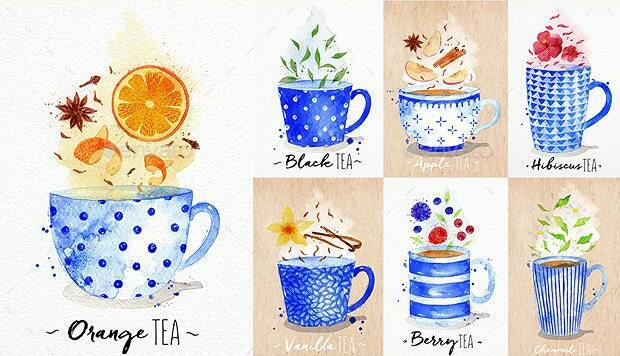 Get these illustrations designs for a quirky and charming look to your tea party menu card or tea house by the park. They are light and pleasing to look at, and are a unique way of showing off what you’ve got in store for your guests. 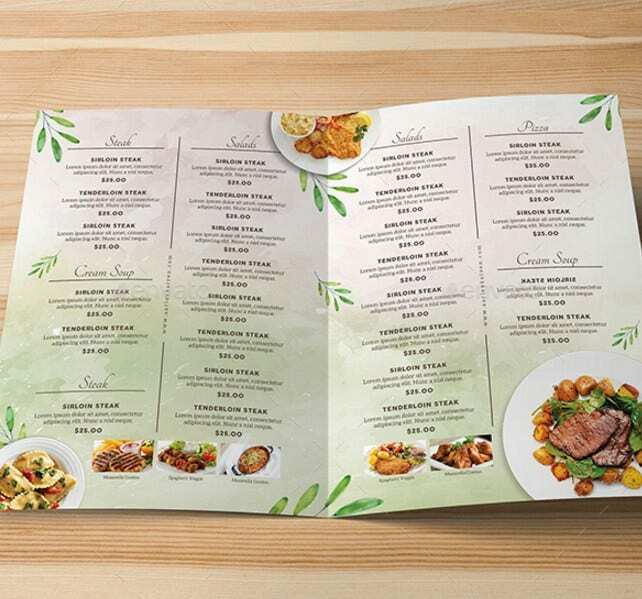 Do you need a takeaway menu template for your Pizza Parlor? Then you’ll definitely need these Watercolor Pizza Menu Illustrations. 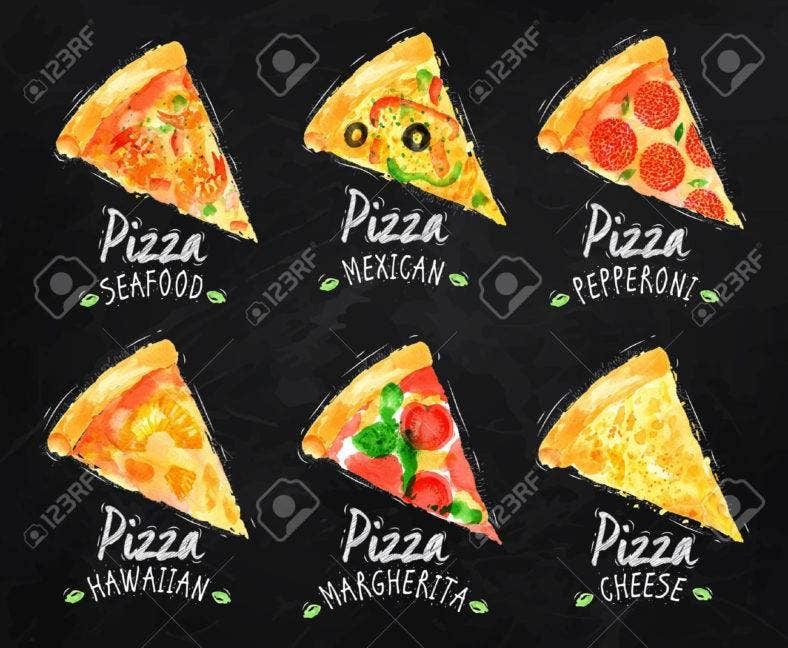 Download this illustration bundle for fun and creative pizza illustrations you can use in your menus. They’re charming and just as savory. 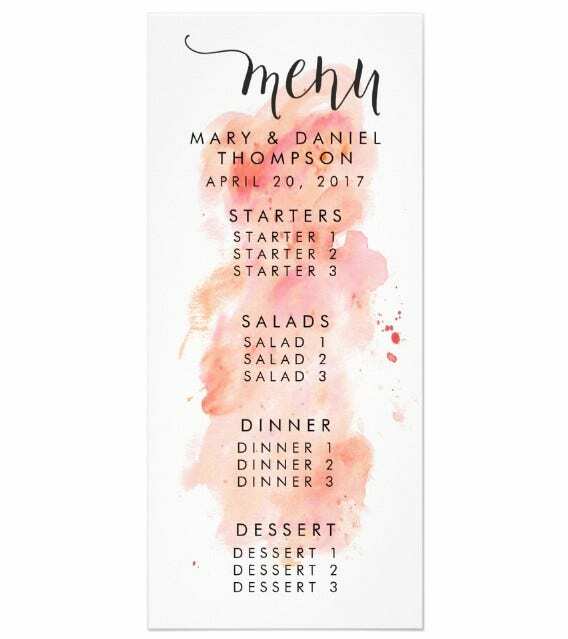 Get amazing watercolor floral designs for your menu card by downloading this Floral Watercolor Bridal Shower Menu. It’s absolutely dainty and delicate, and exudes romance and femininity perfect design for a bridal shower, indeed. Get this beautiful design and easily customize the content according to your own party. Own a dessert menu like no other using this Watercolor Desserts Menu Template. It had a rounded design surrounded by mouth-watering watercolor illustrations of all your favorite desserts. You can freely download this design and add in your list of desserts with a simple yet distinct typeface. Just make sure you’ve got all the desserts shown in the illustrations so as not to disappoint people’s sweet tooth. If you’re the minimalist type, then you definitely won’t go wrong with this watercolor menu design. Download the Minimalist Watercolor Menu Flyer for a monochromatic watercolor design with a clean and well-organized food list in your menu. You can customize the color scheme and text to fit your aesthetics while maintaining the kind of minimalism you desire. The Pink and Gold Watercolor Splashed Menu Card is a simple yet distinct menu design you can use for your birthday bash, bridal shower, graduation, or bachelorette party. Get this design for a clean but totally feminine look for your event. It’s got a splash of pink watercolor and gold glitter to give a hint of personality and a neat list of food categories to entice guests. Get yourself a custom-made wedding menu design to go with your watercolor wedding invitations. The Custom-made Watercolor Wedding Menu is sure to make your guests envious while totally head over heels with your menu design. It’s authentically hand painted in watercolor, complete with illustrations and typography to bring the event to life. have yours customized to perfection to fit the theme of your event. 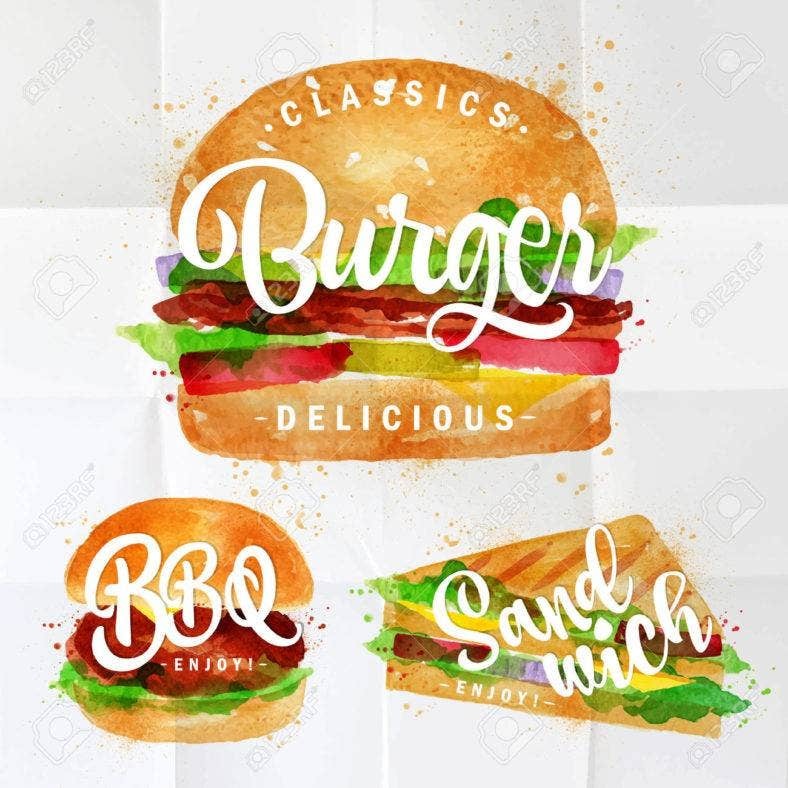 Download these Classic Burger Menu Illustrations and pair them with your sample chalkboard menu for edgy and urban menu card designs in watercolor. This illustration bundle is freely available for you to customize and incorporate into your menu designs to give it a fresh and eye-catching quality. Even your cocktail menu can be effectively and beautifully designed in watercolor. This Watercolor Cocktail Menu Design is proof that watercolor designs really are refreshing and tasty. 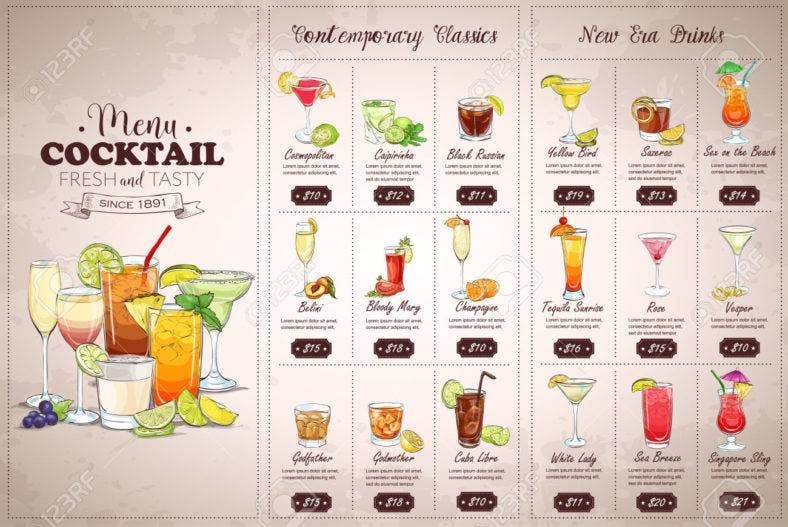 Download this menu design for free and have your cocktails looking just as fancy with these illustrations. 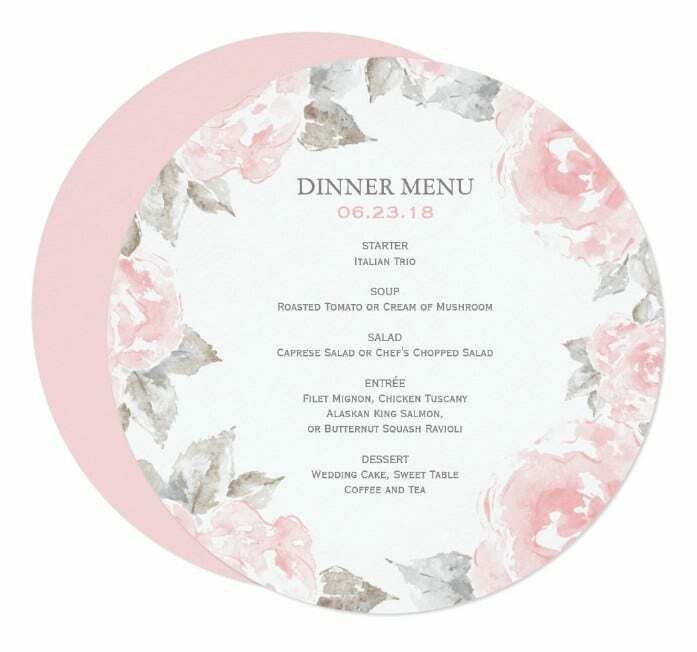 This Rounded Watercolor Dinner Party Menu is one sample wedding menu you won’t find anywhere else. 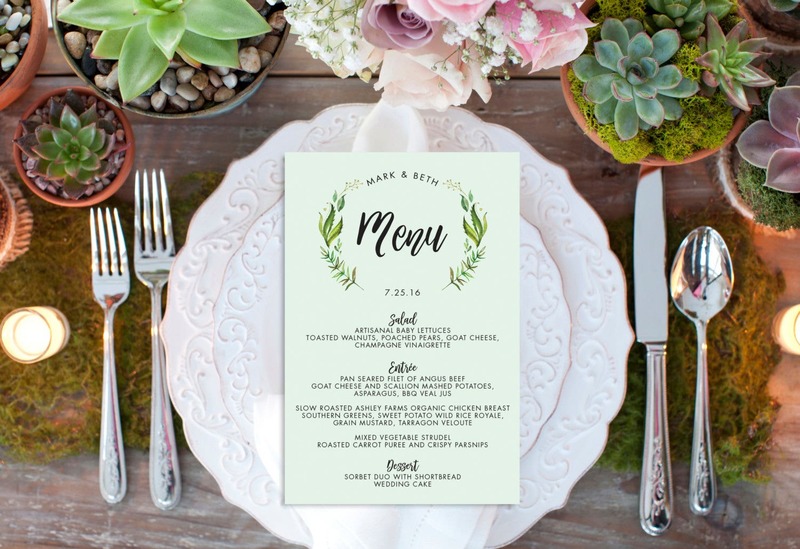 Get this unique and sophisticated design to be able to bring your own wedding reception to life with watercolor floral pastels and clean typography. 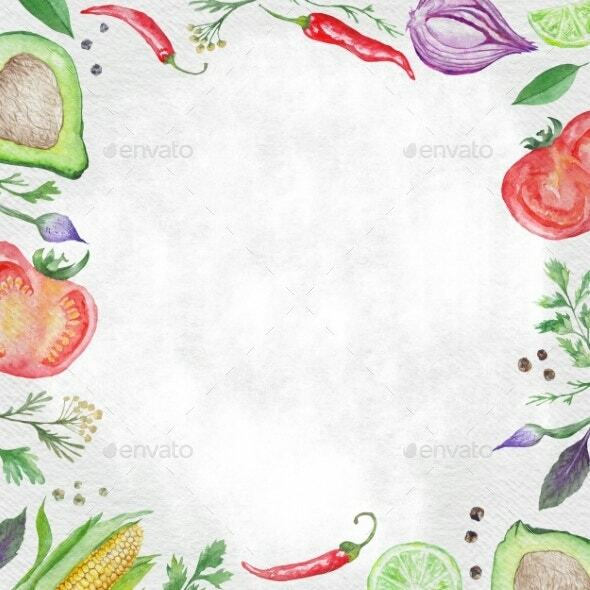 Have vegetarians swooning over your cafe or restaurant by designing your menu cards and flyers with this Vegetarian Menu Watercolor Border Design. It’s a unique way of presenting your menu, and will definitely go well with watercolor typography to cap off the look. Get this border design while it’s fresh and trending. Bask in minimalism with this Printable Watercolor Menu Template. You can easily customize this printable design to fit your own themes and aesthetics. It gives off a simple elegant vibe that looks as professional as it is engaging. Download this design and create a unique look of your own! If you’re planning a rustic and nostalgic birthday party, the Green Leaves Menu Card Design is one sample birthday menu that’s perfect for the job. Get this watercolor menu design for a delicate and heartwarming design. The color scheme is definitely refreshing to the eyes, and the card’s overall presentation projects pure sophistication. 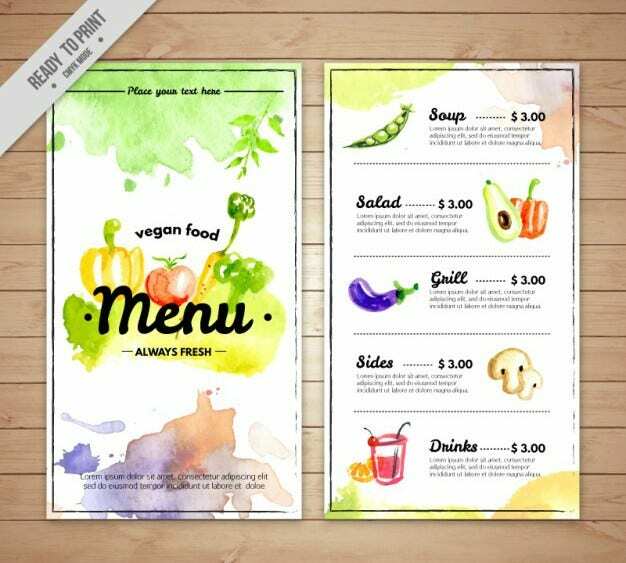 Make vegan food even more appealing with this Vegan Food Watercolor Menu Design. You can freely download this vector template to help you create unique watercolor menu designs of your own. Play with splashes of colors and simple food illustrations with this design. The Minimalist Floral Watercolor Wedding Menu is up for grabs and it is absolutely charming. Make the most romantic and special occasion of your life even more so with this wedding menu card design. It has a simple and minimalist design with a floral wreath at the top of the card and an organized food presentation at the bottom. You can freely customize the colors and fonts to fit the theme of your wedding. And there you have it, a set of creative and mouthwatering watercolor menu card designs you can very well take as your own. Download your favorite designs and have your menus looking elegant and charming. Your guests are sure to be delighted with these beautiful illustrations. You can browse for more food menu templates and watercolor illustrations to adorn your own menu cards with.